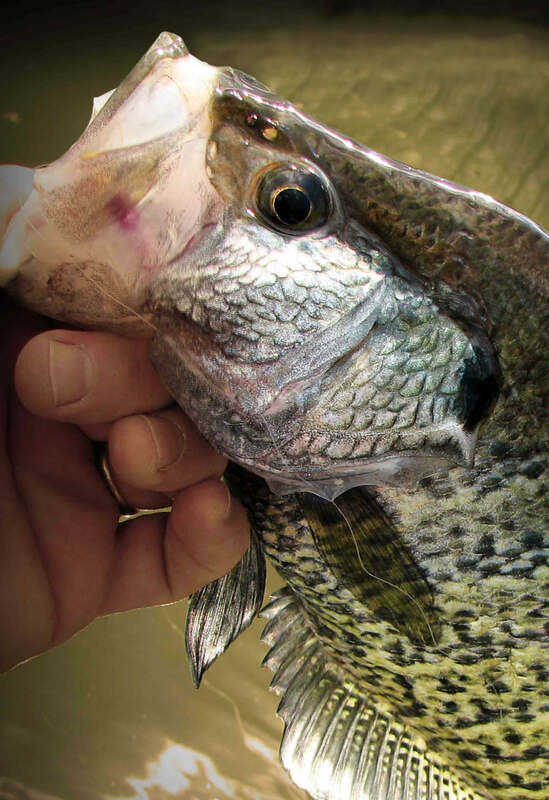 For Iowan’s all across the State, crappie fishing means that old man winter has finally released his grip for the year and the weather has become seasonably warmer. Days have become increasingly longer, sun warms the soil and the water and nature in general is coming out of a long winters slumber. During the month of May, anglers will start chasing crappies as soon as they can wet a line or get the boat in to the water. 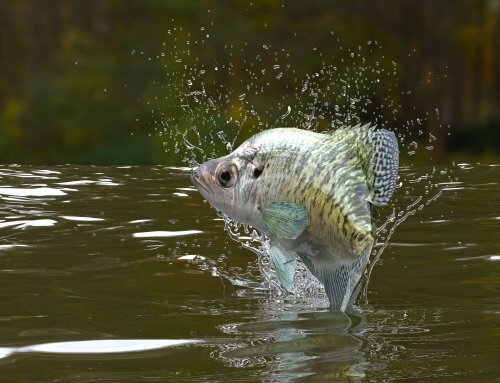 As the month wears on though there is that phenomenon we all look forward to…the crappie spawn. 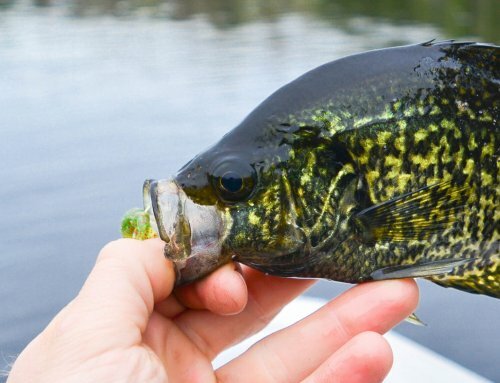 Crappies generally start their migration from their winter haunts in deeper water when surface temperatures start warming toward the 45-50 degree range. They will congregate around entrances of creek channels till the water temps start to hover in the 50-55 degree range, where they will begin to make their way to shallower haunts. Crappie will use secondary creeks and bays, using the channels hidden beneath the water as highways. This is a great time to start drifting with minnows or casting a small Road Runner Crappie Thunder or the original Marabou Jig. Some of the go to colors are chartreuse, chartreuse/black, white and in some cases pink. 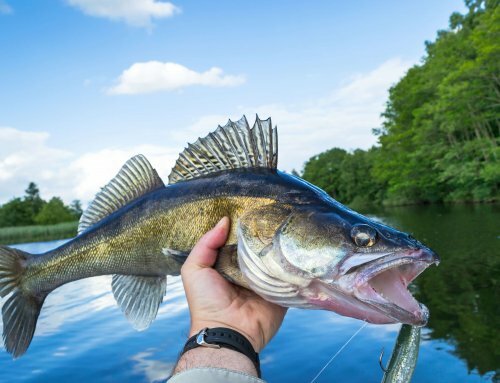 There are a number of smaller minnow baits that will work well, however keep in mind that most of the fishing you’ll be doing is going to be in cover. Males will start moving into shallower water fanning out spawning beds when the water temps start moving to that 55-60 degree range. Female crappie will hang out in deeper areas while the guys do all the work, congregating around structure close to drop offs. Whether you find crappie shallow, or you lock on to a nice group hanging around some structure in deeper water, they will feed more aggressively as spawning draws near. As surface water temps reach the 62-65 degree range conditions become almost perfect for shallow spawning crappie. The females will move in and around brushy cover near spawning beds that have been cut out by the males. This is a great time to drop a live minnow below a bobber, enticing those nice slabs to latch on to your offering. Cold weather fronts will set the whole process back a few days though, even to a few weeks, depending on the severity of the front that moves through. Surface temperature changes as little as two degrees will affect the crappie and you may find that the fishing is off considerably. It may take a bit of scouting but if you are mobile you can use electronics to check water temps. You can locate the warmer water by hitting the sunny exposed side of a lake that has a warm southerly breeze blowing in. This can be enough to affect the fishing, and make or break the day. Crappie can be veracious predators in the spring. Sounds kind of funny when you think of crappie; however, the pre spawn and spawning periods make these fish aggressive and hungry. Minnows in many cases are the go to bait this time of year. One important key is to find the depth that these fish are feeding at. Once you’ve done that, tie on a slip bobber and get your bait down to the fish at the same depth every time. In recent years we’ve seen a huge improvement in artificial baits and one that tops the list is Berkley Gulp! Alive! I’ve used these effectively by tying on a small stick bobber and a very small jig then adding a couple of the small Gulp! Alive! Minnows to the jig. Toss it out and allow the jig to settle and then reel slowly with subtle tugs on the line. This gives the jig and minnows a swimming action that crappie can’t resist. You’ll see your bobber slowly disappear beneath the surface of the water, that’s your queue to set the hook! Another great option during this period, especially if you like to wander the shore line of many of the smaller bodies of water in Iowa, is to tie on two small jigs in tandem on light spinning gear. These can vary in size and weight but typically with a two jig system you’ll want to start out with the smaller size like 1/32oz or 1/16oz. This tactic can be a blast if you find yourself a nice pile of crappie that are bunched up and eager to jump on your bait. Toss your jig combo out there and see if you can’t catch a couple at a time. This can really liven things up if you have your kids with you. Remember Dad, do the casting, we don’t want any involuntary ear piercings when your son rips that rod around like he’s swinging for home plate. Your daughter will shriek again, your son will think its cool, but Mamma will NOT be happy! Okay, beyond entertaining your kids and yourself because you know you’ve had a good laugh at their expense, there are countless ways to fish for crappie. Trolling is an effective way to locate fish, however make sure you have a way of marking where you get the bites. GPS works great, but in a pinch throw out a marker so that you know at least where your boat position was when you started catching them. If you find an area where you have a strike every pass it might be a good idea to set up shop on this area and slip bobber the school of crappie in the area. Crappie will be shallow for the extent of the spawn, but what happens to the fish following all that activity? The females head off to deeper water to rest up after an active spawning period and the males will hang out in the shallows guarding the nests. Fishing the shallows for males will last a while longer till the young fish have moved on, then they too will move to creek channels and find their comfort zones. The post spawn can be a tough time to catch crappie. These fish will scatter and are found in smaller groups of three to four fish. During the post spawn fish won’t move much, good electronics will help in finding active fish. Crappie will suspend off of deep creek and river channels. Look for standing timber, stumps and brush piles in about 20-30 feet. “Anglers should fish a foot or two above the thermocline”, continued the biologist. If they are actively feeding on a school of baitfish, drop a jig/minnow rig down using light line and a light jig. If you have a bit of wind, drifting through the area with this rig will produce for you as well but increase your weight to keep the bait in the strike zone. Pan fish, such as crappie, offer anglers across Iowa action all year long. The spring spawn can be a lot of fun for young and old alike. Post spawn crappie requires a bit more sleuthing but can offer just as much action once found. 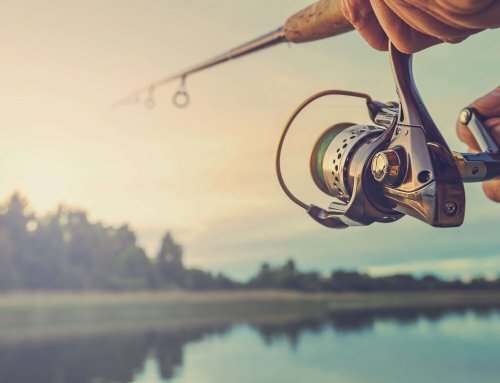 Remember that in Iowa we have a 25 fish limit on crappie per angler per day, visit the Iowa Department of Natural Recourses for more information. 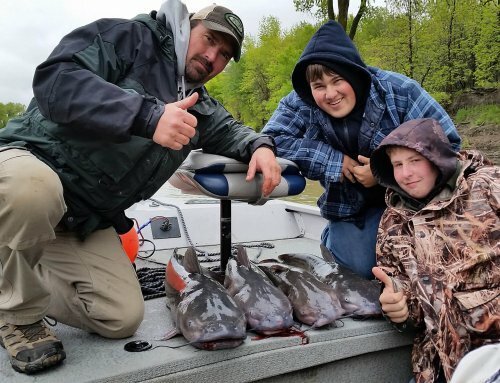 Take a kid fishing this spring and introduce them to this great sport that Iowans love, the future lies in the hands of these young anglers. Tight lines all!